Place the graham cracker crumbs in a bowl. Pour the melted butter on top and mix well. Pour into your temp-tations® pie plate or cake pan. Press into the bottom and sides. Refrigerate for 15 minutes. Place the cream cheese in the bowl of a stand mixer. Add the powdered sugar and beat until smooth. Add the lemon juice and zest and mix well. Slowly mix in the whipped topping just until combined. Pour mixture into the prepared crust and refrigerate for 2 - 3 hours. When the cheese mixture has firmed up, place the jam in a suace pan and heat on low just until melted. Place two or three star cookie cutters on top of the pie. Spread the warmed jam on top of the pie going around the cookie cutters. Refrigerate for 1 hour. 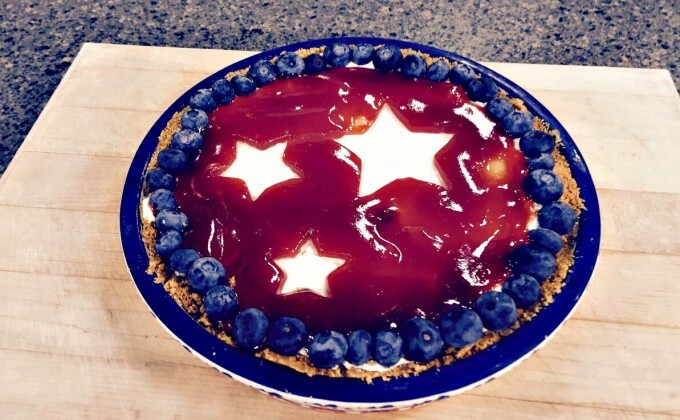 Remove the star cutters and line the outside edge of the pie with blueberries.